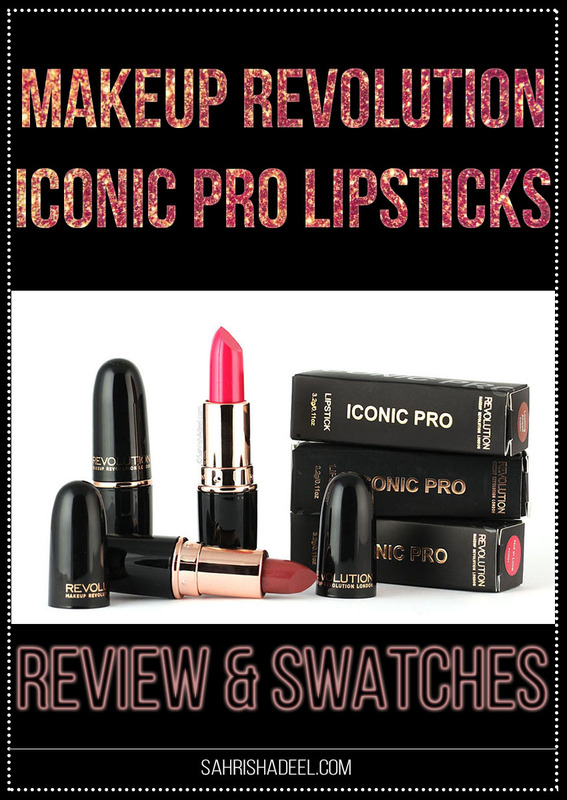 Revolution Iconic Pro Lipsticks by Makeup Revolution - Review & Swatches | Sahrish Adeel - Malaysia based Pakistani Beauty & Lifestyle Blogger! 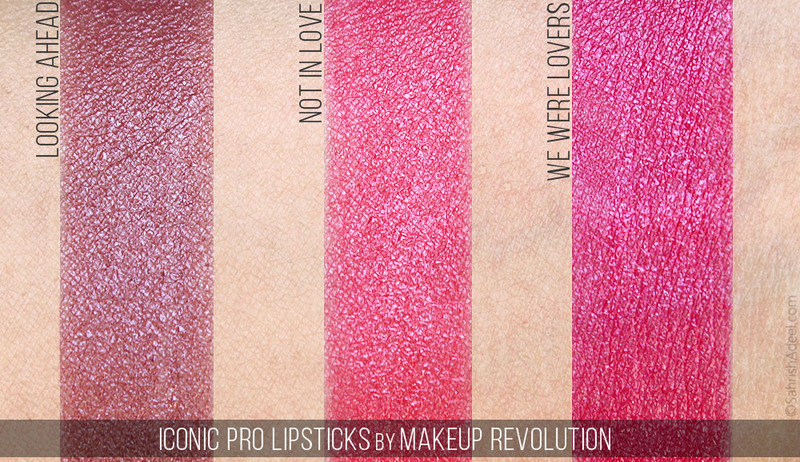 Iconic Pro lipsticks by Makeup Revolution are vegan, cruelty-free and come with big claims but are they really good? Today I bring you an honest review and swatches to help you make a better shopping decision. The lipsticks come in a card box with plastic tubes shaped like a bullet with rose gold and black combination. I absolutely love the packaging and the fact that they snap shut with a click sounds making them travel-friendly. Available in 20 shades. Not In Love looks orange in the tube but it has more of a pink tone when applied on lips. I would describe it as a pinkish orange shade. We Were Lovers is a beautiful fuchsia pink shade. Let me spread the packaging before I proceed to the formula. =D This is one stunning packaging I must say and the shade at the bottom of the tube makes it very easy to pick your desired shade without opening the tube. Packaging gets my full marks and also my heart! The lipsticks have a very nice scent but I just cannot recognize it. It reminds me of my childhood for some reason. I honestly love all the shades that I tried and I am also amazed to see the shade range MUR has to offer in this collection. The formula glides onto the lips like a butter and even though I want to call it a lipstick formula, it just feels like a highly pigmented balm. It is not a bad formula at all but the lipstick does not feel like a lipstick. I really hope I am making some kind of sense here because Iconic Pro Lipsticks remind me of butter lipsticks I tried in past. The pigmentation is there but it goes up to a medium coverage on my lips and I can still see my lip line unless I use a liner or a concealer underneath. All of these have a sheen to their finish, they feel really light on lips and are super moisturizing. They do not enhance dry lips but at times can set in lines. I am not sure why this happens because it does not happen every time. Wear time is 2-3 hours without eating oily food and they come off easily with a wet wipe. What I loved most about these that they do not leave any nasty residue or feather during the wear time. Overall, even though Iconic Pro Lipsticks did not succeed for giving me a full coverage as per claims from the brand, these lipsticks are really great if you are looking for every day, travel, and pocket-friendly option. The shade range is great and for me, they work like a combination of balm and lipstick during the day. Have you tried these lipsticks? Do you think they are worth trying?